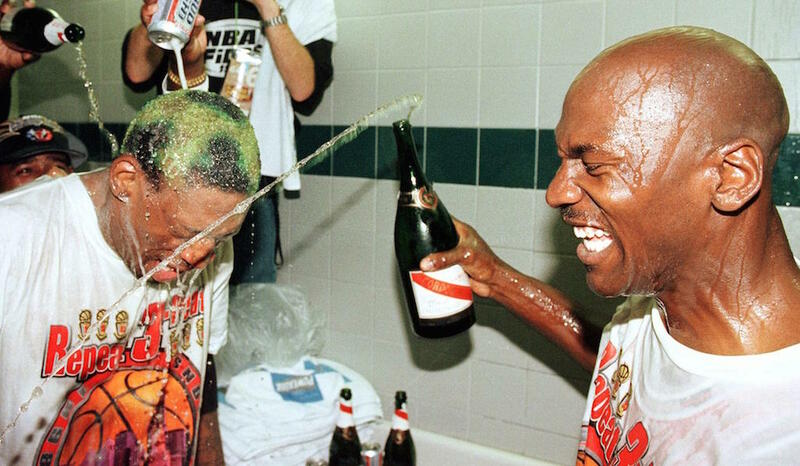 When an NBA team wins a championship, it’s a time-honored tradition to douse each other in alcohol as a means of celebration. In turn, fans of said team look to the booze to bask in their team’s glory, while those who support the loser tend to attack the bottle for the exact opposite reason. Happiness, sadness, basketball, and booze — the four golden pillars of the chase for the title. Now, we’re not suggesting this is the way it should be; we’re just merely calling it like we see it. Therefore, if the connection is already there, why not just fuse them into one? Lucky for you, someone took the time to do just that. And it’s glorious. Just as he did when he turned NBA logos into Nintendo games, graphic artist Mark Avery Kenny used his skills to redesign NBA logos in another completely original way, turning beer and basketball into a superb “N Beer A” series. Once again, this guy shows us that he has serious game, and after looking over each and every one these creations, we have to admit, we have some favorites. For us, in the world of NBA logos reimagined as beer brands, these five are nothing but net. The Houston Rockets may have failed to get off the ground this season, but this logo redesign is absolutely out of this world. Since we have nothing but good things to say about Red Stripe (Hooray Beer! ), there’s no reason why we shouldn’t get behind “Rocket Stripe.” Plus this product would be a great sendoff for Dwight Howard, you know, for when he ultimately takes his talents to a galaxy far, far away next season. It’s not the fanciest brew on the market, but when your team can’t get over the hump, it will be there to cheer you up with its excellent wordplay and creative use of a raptor clawing a basketball. Trust us, you’ll feel hip(ster) in no time. This redesign is just too perfect for words. Seriously, it’s as if the Milwaukee Bucks — and their logo — were born to be reimagined as Old Milwaukee. Granted, some may knock this creation for being a little too obvious, but we don’t see it that way. It’s simple, unthreatening, and doesn’t force the issue — kind of like the Bucks themselves. We bet the Milwaukee faithful wish they had some of this at their disposal right about now. The Cleveland Cavaliers may have been overmatched in Game 1 of the NBA Finals, but this logo interpretation can stand up against the best of them. Whether you’re reaching for a Corona or hoping to take the edge off with a “Cavalier Extra,” just let your worries drift away. Your beach is out there, and you’ll find it. Even if you happen to live in Cleveland. This redesign is so good, it’s on fire. The Miami Heat logo fuses perfectly with that of Shock Top. The basketball, the shades, the flames, everything is hot, hot, hot. Are we using too many “Heat” references? Probably. Does that bother us? Not really. Now excuse us as we grab ourselves a “Hot Top,” we have to go soak up that last bit of sun. To see the rest of Mark Avery Kenny’s “N Beer A” series, check out his Instagram here.